Rambling Ray: It's All Over Now......Or Is It? It's All Over Now......Or Is It? On June 10, 2007 the last Sopranos episode was shown, or was it? For the last 7 years this show has ruled the airwaves, and most peoples lives on Sunday nights. I know for myself and two son's for the past couple of years we enjoyed getting together to watch our favorite show. I don't think I've enjoyed a TV show as much since "Dallas", or perhaps "Deadwood." For me it's the acting, and no holds scripting that adds a certain "realism" to the show because I'm not big on fantasy type programs, or reading material. My first thought at the end was "are you kidding me?...that's it? but then I decided to watch it again, and then realized the brilliance of the episode. Like most I was expecting a big blaze of glory shoot- em up, but no that didn't happen. Half expecting Tony to be shot at any minute... again never happened, or did it? The ending has left the door wide open for spin offs, or perhaps a final 2 hour special that could answer a lot of questions. I never thought I would fall victim to another TV show after Dallas because you start to alter your day to day activities to make time to watch this show, but that's what made it extra special for me. Not only was I making time for the show, but it helped me realize I was making time for family. 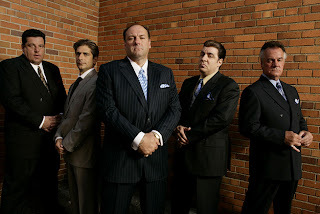 The Sopranos always made reference throughout the episodes the importance of family, and not just "the mob family" but the importance of spending time together. Today most families are so busy working "outside" the home there never seems time to work on the "inside home." Our society is geared to life in the fast lane with ready made meals, and micro wave ovens, drive throughs, "Mom's in the work place" it has created the "sit down family meal time" a memory of the past. I'm hoping for my own family that we continue to make time for each other. As Tony Soprano would say" it's important to make time for family." I have read through all of your posts and am, as always, in awe of your tremendous personality and talents. You underestimate yourself, you know.....if you ever want to have a girlfriend, just sign me up!!!! !